Roulette game is a very famous gambling activity in the world. Many people all over the place find satisfaction in playing this game not only because they have a 35/1 chance to win but also because it is much fun. The roulette table is an essential part of the roulette game. The most important part, except the legs of the table, is the layout, where the bets are, actually, made. Your main aim in the game of roulette is to guess the number, which will come up and, therefore, to make correspondent bets. It can be the color, even or odd numbers, or the exact numbers. We know American and European roulettes. But what is the difference between them? At first, we think there is a slight distinction. 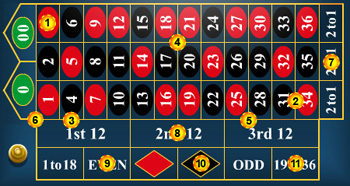 European roulette has 37 pockets: numbers 1-36 and 0; the American sister has 0 and 00, which makes 38 pockets. The house edge in the European variant is 2.7 percent, while only one additional pocket of 00 doubles it and makes 5.26 percent. This much increases the roulette odds of winning the bet. We all remember that the main idea of the game is to guess the number or the sector, where the ball will land. You might have heard before about the inside and outside bets. Inside Bets are those bets, which you place inside the layout. Straight Bet - you bet on an exact number. Split Bet - you bet on two neighboring numbers by putting the chips on the bordering line between them. Street Bet - you bet on 3 numbers at the same time. All lines of three numbers each are called the streets. So, you put your bet at the end of the street facing it. Square Bet - you bet on 4 numbers at a time. You simply put the chips on the crossing of two lines, which separate four numbers. Five-number Bet - you bet on 5 numbers at the same time. It covers 0, 00, 1, 2 and 3. It is possible only in the American roulette, as only it has 00. You need to put the chips on the crossing of the lines between 3 and 00. Line bet - you bet on 6 numbers. For this, you need to place your chips where two "streets" meet on a crossing line. Outside bets are those bets, which you put outside the layout. Color Bet - you bet on black or red color. Even/Odd Bet - you bet on odd or even numbers. High/Low Bet - you bet on high (19-36) or low (1-18) numbers. Dozen bet - you bet on 12 numbers at the same time. There are three dozens on the layout 1-12, 13-24, and 25-36. Column Bet - you bet on 12 numbers at a time by placing your chips on the line below the highest numbers. It is "2 to 1" bet. In this case you bet on numbers 1-4-7-10-13-16 or other. 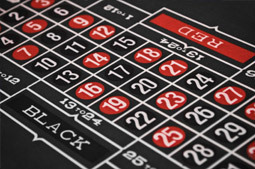 Your payout in the roulette game is determined by the type of bet. The more numbers the bet covers, the less money you receive. 1. The very first thing you need to do is to read the following rules. Then you get the chips of different values just by clicking on them. 2. As soon as you reached "Amount to bet per click" you start betting. You just click on the denomination and choose the place, where you want to make the bet and click on that very spot. Also you need to be attentive to the rules of the casino you are playing in, as different casinos have different table limits. 3. Then click on "Spin." The ball is thrown; you wait until the wheel stops and see if you won. If you placed multiple bets, some of them might lose, some win.